The TE 74 Two Roller Machine is for the study of traction, wear and rolling contact fatigue under conditions of heavily loaded, lubricated, pure rolling and rolling and sliding. 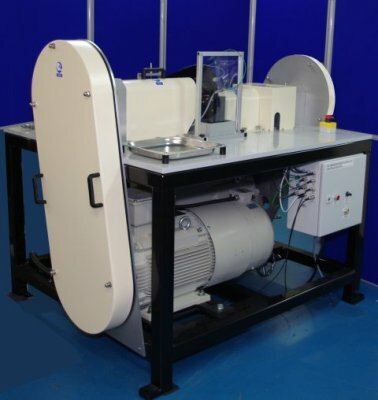 The machine incorporates two motors, one to provide the input power and one to absorb the transmitted power. To achieve the necessary high loads with small diameter rollers, hence high contact pressures, the test rollers our mounted on shafts with bearings on either side, in the “fully supported” configuration. As a consequence, spindle bearings are exposed to, and must run in, the test lubricant. To achieve satisfactory performance in line contact, the mounting/loading arrangement has adjustable alignment, with the upper specimen shaft carried on a pivoted arm and with a spherical bearing incorporated in the pivot axle. Axial alignment is achieved by indexing the pivot axle. Loading is achieved by means of a servo controlled pneumatic bellows actuator with force transducer feedback. The lower specimen shaft is carried in fixed bearings. The drive to the lower roller incorporates an in-line torque transducer for measuring the input torque to the system. It should be noted that the traction measurement is thus subject to parasitic losses associated with the roller spindle bearings. These losses are small but may be quantified by running the unit under conditions of zero slip at different speeds and temperatures. A vibration sensor is provided for detecting surface failure. The upper roller housing is electrically insulated and slip rings are provided on the roller shafts for electrical contact resistance measurement. A lubricant service module is fitted as standard incorporating a sump tank with immersion heater, delivery pump, scavenge pump and oil to water heat exchangers for cooling. The motors are a.c. and powered by conventional vector drives allowing precise control of speed. Power is re-circulated electrically via a common d.c. link between the drives, upstream of the frequency inverter stages. Total power requirement is thus limited to the system losses. For control purposes, one drive is designated as master with the second drive deriving its speed set point, adjusted for the required slip ratio, from the master drive. Two versions of the machine are available. The TE 74S (standard capacity) incorporates two 5.5 kW motors, a shaft centre distance of 40 mm and 12 kN loading system, whereas the TE 74H (high capacity) has two 30 kW motors, a shaft centre distance of 70 mm and 30 kN loading system. 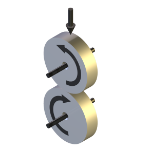 The lower roller spindle is connected to an in-line torque transducer via a cardan shaft; the transducer is connected to a lay shaft by a coupling and the lay shaft connected to the motor by pulley and timing belt. The upper roller spindle is connected to a lay shaft by a cardan shaft and the lay shaft connected to its motor by pulley and belt drive. The TE 74 has PC based sequence programmable control and data acquisition. This is provided by an integrated Serial Link Interface Module and COMPEND 2000 software running on a host PC, operating under Windows. Data is stored to hard disc in standard spread sheet compatible file formats (.csv or .tsv). Characteristic showing motor torque-speed characteristic (available torque) compared with roller generated torque, assuming traction coefficient of 0.1, with corresponding reduction in applied load. Note that the full load can be applied at full speed in pure rolling or under conditions where the traction coefficient is less than 0.07. Assuming 40 mm diameter rollers and traction coefficient of 0.1, the maximum permissible load at maximum speed is 8.7 kN. Note that as the minimum specimen diameter is 15 mm, a diameter of greater than this is required for a crowned roller sample machined on a 15 mm shaft. The practical minimum diameter for a crowned roller is thus 20 mm. Characteristic showing motor torque-speed characteristic (available torque) compared with roller generated torque, assuming traction coefficient of 0.1, with corresponding reduction in applied load. Note that the full load can be applied at full speed in pure rolling or under conditions where the traction coefficient is less than 0.08. Assuming 70 mm diameter rollers and traction coefficient of 0.1, the maximum permissible load at maximum speed is 27.3 kN. 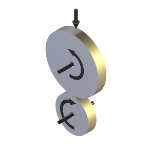 Note that as the minimum specimen diameter is 30 mm, a diameter of greater than this is required for a crowned roller sample machined on a 30 mm shaft. The practical minimum diameter for a crowned roller is thus 40 mm.